A quick-attach system allows easy hookup to implement and same-truck flexibility. The new Retriever Transport Hitch from Bestway Inc., solves many problems surrounding the logistics of moving large drawn planters, grain carts, tillage and fertilizer equipment between distant farms or to and from dealerships. Trucking with a two-point or drawbar hitch makes moving implements from farm to farm much easier. Bestway's new Retriever Transport Hitch mounts on semi-tractors in about five minutes. 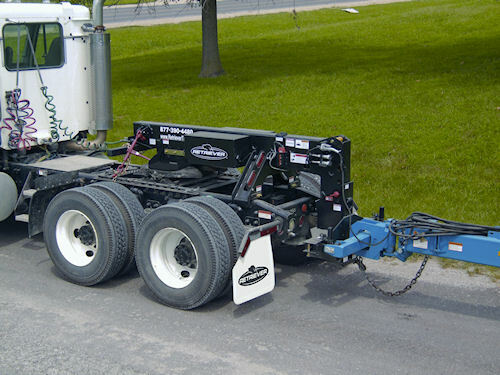 The Retriever mounts on a semi-tractor's fifth-wheel and frame in about five minutes, and uses a 12-volt-powered quick attach system to hook up to implements and lock them in place for transport. The exclusive two-point hitch design allows changing from a Category III system to a Category II system (in about 10 seconds) for towing mower conditioners. For drawbar type implements and planters, a removable heavy-duty drawbar with 12,000-pound tongue weight capacity, is included with the hitch. Also, there's a remote hydraulic valve for lifting or folding equipment before towing. For more information, and a complimentary DVD video of the Retriever Transport Hitch in operation, call (877) 390-4480, or email sales@retrieverSLT.com.